Most of us who are over 30 know someone who has suffered from breast cancer, the second most common cause of death among women in the US after lung cancer. In fact, in the US, women have a 1 in 8 chance of developing breast cancer in their lifetime. 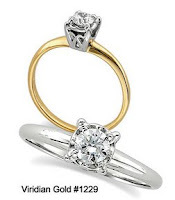 To call attention to these serious statistics, many survivors of breast cancer, or friends of those afflicted, choose to wear jewelry carrying the symbols of the fight against this tragic disease. 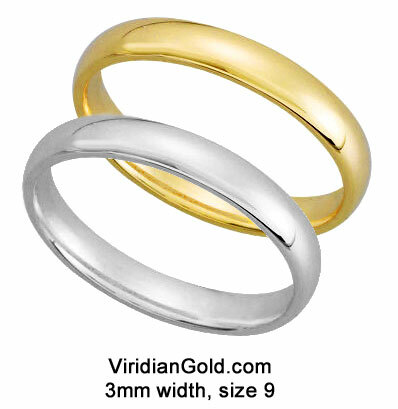 We have recently added some new items to the Viridian Gold Awareness and Causes collection, available in both 14K gold and sterling silver, which call for awareness of breast cancer. The pink ribbon has become the world-wide symbol for breast cancer awareness, and is the basis for new additions to the our store. For instance, the Pink Sapphire Awareness Brooch, #6004, is constructed of pink 14K gold, and covered with radiant pink sapphires. 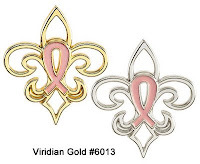 Our 14K gold Fleur-de-Lis Breast Cancer Awareness Lapel Pins, #6013, can be worn by men or women to show their solidarity with this cause. 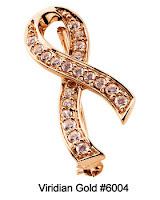 And, if your budget is more limited, you can choose from several beautifully-made sterling silver pieces such as the versatile Breast Cancer Awareness Ribbon Brooch/Pendants, #6030, which can be worn either as a brooch or a pendant!